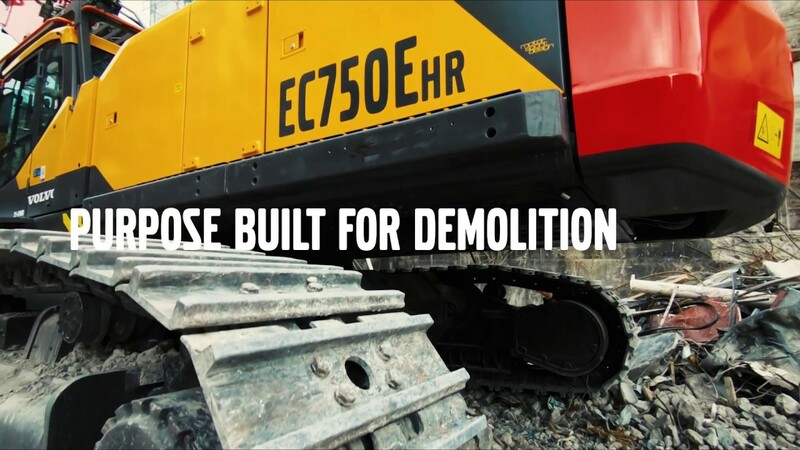 The high-reach EC750 HR excavator reaches to 118 feet and can carry demolition tools weighing up to 8,000 pounds. Operating weight is 221,000 pounds. 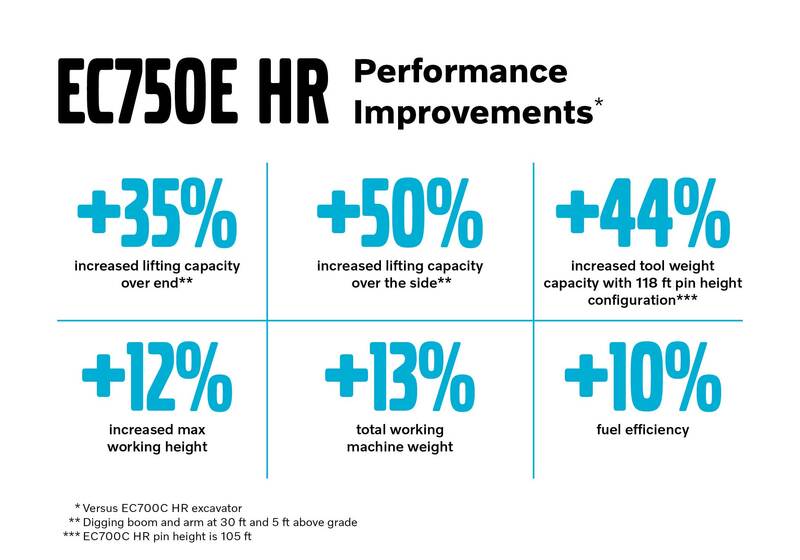 Lifting capacity over the end is 35 percent more than the predecessor EC700C HR, and maximum working height is 12 percent higher. A patented hydraulic modular joint concept uses a two-pin hydraulic lock mechanism to allow the high reach to be changed into a digging configuration with only one person in less than an hour. A second hydraulic modular joint on the extension boom allows the angle of both the extension and the digging boom to be set between bent and straight configurations. Two high-reach boom sets offer 118-foot maximum pin height with an 8,000-pound attachment, or 85-foot pin height with an 11,000-pounds attachment. A digging boom set has a 14.4-foot extension with a 59-foot pin height. Based on the EC750E excavator, the undercarriage of the EC750E HR is 1 foot 9 inches longer and 2 feet 10 inches wider than that on the EC750E, on which it is based. It is retractable with easy-to-remove track frames and the ability to self-assemble and reassemble, according to the company. Watch a promotional video below.